Probably earlier to mid 20th century. Sole surviving, rectangular-plan, traditional red brick smoke house in Torry, located close to dockside in heart of fish processing area on S side of River Dee. 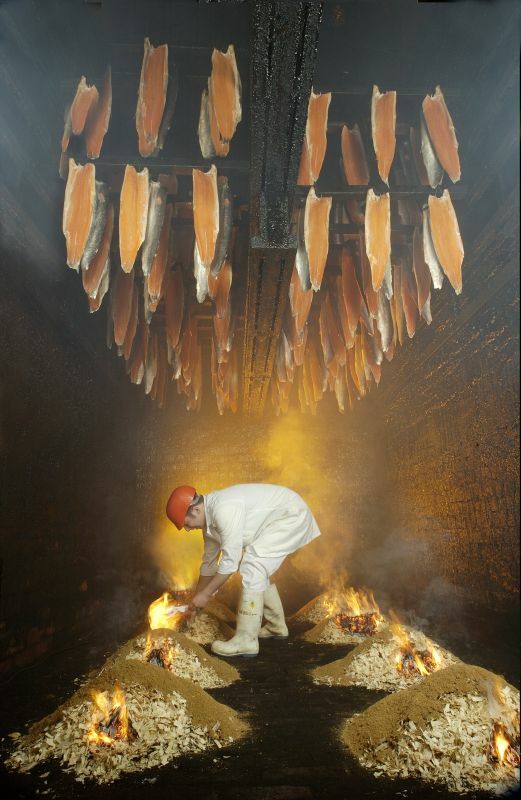 Only premises still (2006) using traditional method of smoking over fire mounds in whole of Aberdeen fish curing industry. Tall brick kiln projecting above later office and fish processing units. Base of kiln now encased in breeze block, and metal and polystyrene foam sandwich to comply with stringent health and safety regulations. Gable ends of smoke house kiln to N and S, longer E and W elevations with steeply-pitched corrugated roof rising to full-width, slate-roofed, 4-part, timber-louvered ventilator with brick gablet ends. INTERIOR: entrance to kiln through low fire door at base enclosed by later units. Kiln floor of long firebricks, with tenters above. This rare structure sited at the centre of a busy fish processing area which has survived throughout the 20th and into the 21st century is made all the more remarkable as it still fulfils its original function. A small group of similar structures, all listed at category C(S) in 2005, survive to the north of the river in Aberdeen but none serves its original purpose. Bricks for building kilns in the area would have been readily available at the Seaton Brick Works which was located in Sinclair Road just a short distance to the west beyond Crombie Road. damped with sawdust to create smoke; this was constantly tended as naked flames would cook the fish rather than smoke it. At John Ross Junior, whole gutted salmon are hand filleted, dry salted (not brine soaked), hung on tenters and smoked over small fire mounds of oak chippings which need careful attention for a period of anything from 12 to 24 hours or even longer. The required duration of smoking has always been gauged by a skilled master smoker who checks manually for optimum smoking. This depends on a variety of factors including size and thickness of the fish as well as atmospheric conditions and wind direction. After a 'tempering' period, the smoked fish is sliced and packed. The kiln at John Ross Junior is used every day and can take anything from one to four hours to load. The second smoking method, known as London smoking, used smoking pits some two feet deep with tenters suspended above. This method produced hot smoked fish ready to eat similar to Arbroath Smokies. The fishing industry at Torry boomed from the 1880s onward due largely to the success of steam trawling. The growing industry created many jobs which led to an influx of immigrants from North and South Shields, Grimsby and Hull. This, in turn, led to a rash of tenements in the area, some at Abbey Road and Fisher Square were designed by William Smith, the architect of Balmoral. Fishing and its associated industries created so many jobs, that the population became divided into 'fishers' and 'non-fishers', the latter being involved in farming. The Evening Express of November 4, 1971 recalled that 'Torry's main interest was always fishing. As recently as the 1950s there was fleet of just over 40 great-line boats operating from Aberdeen and these berthed at Torry dock'. B St. Peter's Court 191 Victoria Road, Torry. B Sacred Heart, Church of the (R. C.) and Presbytery House, Grampian and Glenbervie Roads, Torry.